This travel story comprising our memorable road journey from Pokhara to Jomsom and trekking to Muktinath, dates back to October 2011, which was published as the cover story- "Once in a Lifetime: Mystic Mustang and Holy Muktinath" in the May-June 2013 edition of Travel Secrets magazine. 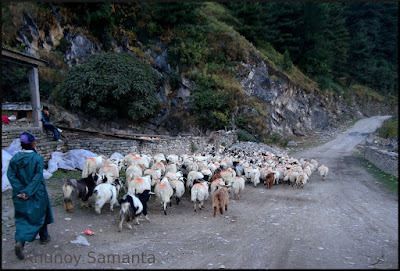 I had published the Jomsom to Muktinath Trekking tale in one of my old blogs too and it gave me immense satisfaction whenever any traveler friend had approached me to inquire about the Muktinath trek. 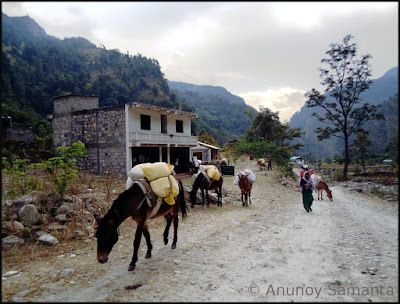 But, after good 5 years of that blogging I found the content and formating of my mystic Mustang travel story not as much reader-friendly as I would love to pen down today. 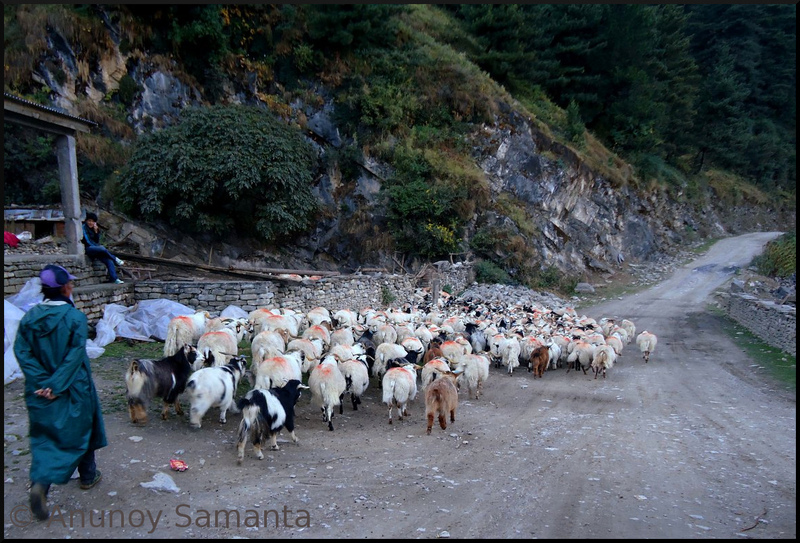 So, here's a small effort from my side to rewrite the closest-to-my-heart travel story of Pokhara to Muktinath. Yea, old scotch in new bottle... but trust me, it'll definitely be a worthy read! Diwali was creeping nearer and the desire to make a short trip somewhere with the excuse of celebrating the auspicious Diwali was budding in my heart. Dushera leaves had been exploited more than any official authority would permit, so chances of indefinite hitchhiking was far beyond a foggy fantasy. Idea of solo traveling to nearby places didn’t give me much relief due to the brutal fact that I had consumed my travel budget for the quarter in the recent wildlife trip. But anyhow, I couldn’t afford to dedicate my 3-4 days in the name of crackers and fireworks. Luckily one of my friends, Ridmi came up with the idea of exploring Mustang and trekking to Muktinath (a sacred destination both for Hindus and Buddhists, lying 3,800 meter above MSL). After hearing the atypical name 'Mustang' (sounds more like an iconic motor variant of Ford or, a dark golden mare from some cowboy movie right?) and doing a bit of web-search I couldn’t resist the temptation of joining the three travelers’ brigade! Beyond Beni all the places are tourist destinations! Mustang is one of the seventy-five districts of Nepal located in the north-central part of the country as a part of Dhawalagiri Zone. Jomsom is the district headquarter of Mustang district. Wild, windy and harsh, yet strikingly beautiful land of Mustang bestrides the Himalayas and extends northward onto the Tibetan plateau preserving pure Tibetan traditions in its upper parts till date. 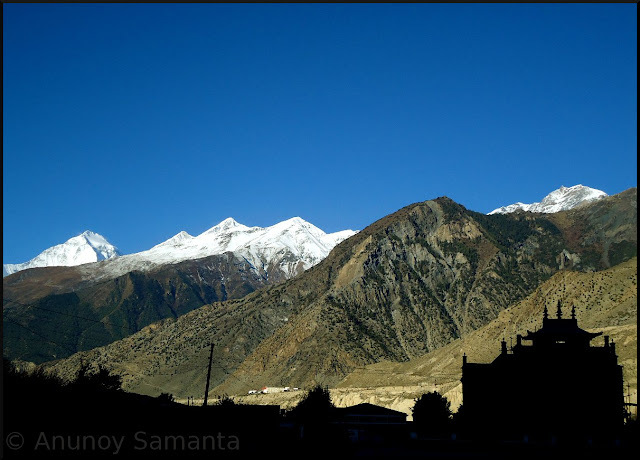 Besides the trekking routes through the upper Mustang and along the Annapurna circuit in lower Mustang, the district is famous for the scenic villages in the lap of snowy peaks, innumerable fountains, waterfalls, springs, pilgrimage site of Muktinath and apple gardens/apple products of Marfa. By the end of 2010 when I had gone for Kathmandu-Pokhara trip I came over Nepal Tourism advertisement in quite a few places, where the caption “Naturally Nepal – Once is not enough” had lured me to the core. I was overwhelmed to realize that I was responding to the call of Nepal Tourism once again within a short span of twelve months! 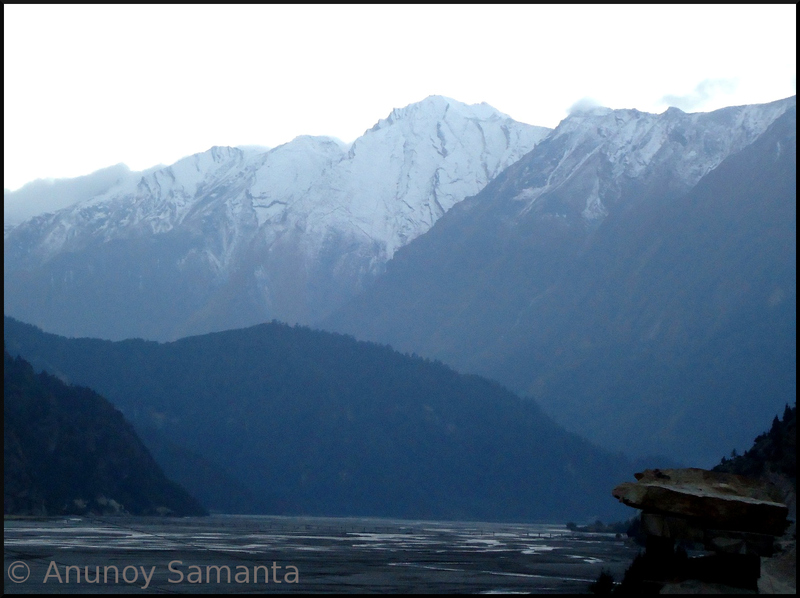 Pretty soon after we left Ghasa we got the magnificent snow clad Himalayan view! Day 1- Pokhara (altitude below 1,000 m) to Beni by taxi, Beni to Ghasa by shared jeep, Ghasa to Jomsom by bus, night stay at Jomsom (altitude 2,743 m). 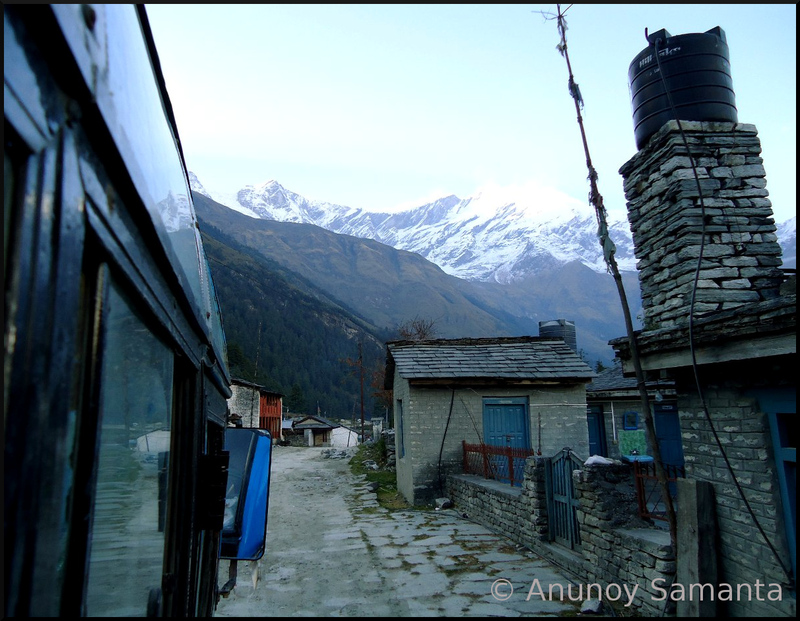 Day 2- Trekking from Jomsom to Muktinath, night stay at Muktinath (altitude 3,710 m). Day 3- Muktinath Darshan (altitude 3,800 m), return to Jomsom by shared jeep, hopping around at Jomsom, night stay at Jomsom. Day 4- Jomsom to Ghasa by bus, Ghasa to Beni by bus, Beni to Pokhara by taxi. Obviously, as none of us hailed from Pokhara our actual travel itinerary was lengthier than this, but, to keep my narration focused on Jomsom to Muktinath trekking I'm taking author's liberty of editing out all irrelevant details. Here Day 1 shall start with a fine morning at Pokhara valley and Day 4 shall end with our dinner time at the same lakeside hotel. Most of the passengers got down at a middle place called Tatopani. Pokhara, situated in central Nepal, is nestled in a region of awesome natural beauty. The valley is filled with lush vegetation, swift flowing rivers and dotted with clear, shimmering lakes. Pokhara is blessed with the backdrop of one of the most dramatic sceneries in the world- a 140 Km of panorama made up of towering Himalayan ranges seen close enough to be touched on a clear day! It is the only place in the whole world from where one can enjoy the majestic view of 8000+ meters tall giants while comfortably sitting below 1000 meters above sea level! Best part is, Pokhara is not just about natural extravaganza... it also has a crazy yet serene nightlife to pamper its tourists. Ah forget the last night, this story starts with a fine morning in some lakeside hotel at Pokhara. We woke up late in the morning as per my last night's presumption. 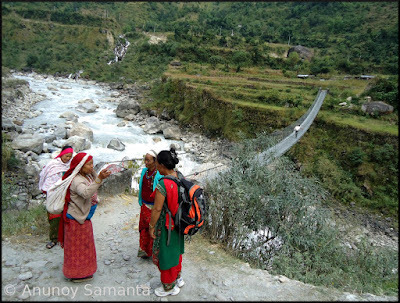 There remained a ‘simply not possible’ chance of reaching Jomsom in that very day if we thought of availing public bus service up to Beni (a place somewhere in between Pokhara and Jomsom from where one has to change the vehicle) after morning 8:30. So we agreed upon reserving a cab at a hiked up rate which comfortably took us to Beni in little more than two hours. There are couple of domestic airlines plying mountain flights between Pokhara and Jomsom, but you've to be an early bird, otherwise you'll miss the worm. From Beni our Jeep started ascending off-road along the meandering Kali Gandaki River. 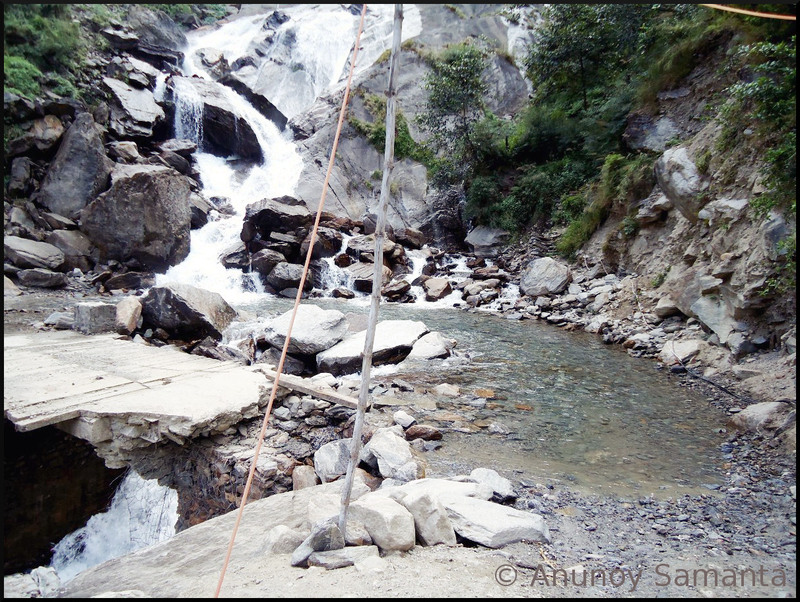 Drive along the under-maintained road alongside the Seti River was pleasant. Having finished our lunch with non-vegetarian Nepali thali our actual off-road journey began! Beyond Beni all the places are tourist destinations, so from Beni onwards public transportation rate differs for Westerners, SAARC tourists (in practicality only Indians come in this half safe side category!) and Nepalese citizens. I was unaware of this fact till then, so my Hindi conversation with the counter men costed me higher fare rate as decided for the Indians, which I realized when I paid for the second half of the journey at Ghasa once again at Indian rate. But after that I was fully conscious to use only Nepali language while purchasing further tickets and managed them all at low local rate. Our Jeep crossed stones, mud, escaped hanging giant rocks and crossed innumerable waterways! 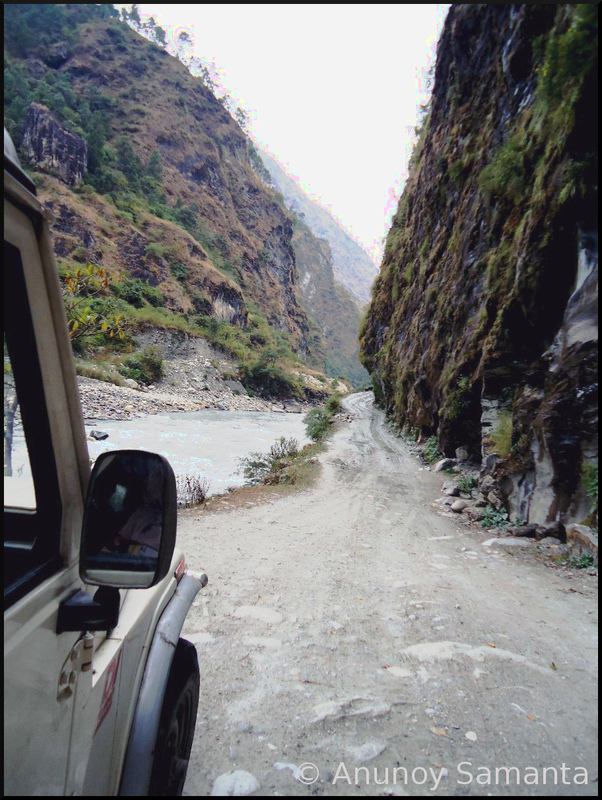 From Beni our Jeep started ascending off-road along the meandering Kali Gandaki River. The path was a combo of all badness a driver wants to avoid in daily driving... our wheels crossed stones, mud, steep ascents, escaped hanging giant rocks and a marginal risk of sliding down the river at every second of the beautiful bumpy four wheel drive! 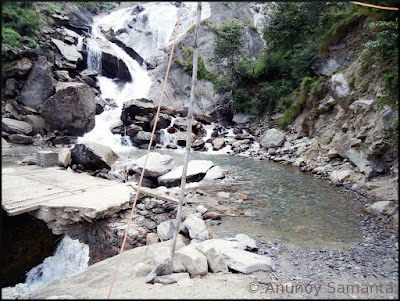 We passed through mountain villages, crossed so many hanging metal bridges connecting villages over two different hills, a lot more fountains and waterways which our jeep had to cross with its steady mountain heart. Just imagine of a moment you are sitting by the open window of your jeep and the high flowing fountain water knocks your door with its full glory misting your vision with the splashing out tiny water droplets... surely you’ll feel like you’re in heaven! Most of the passengers got down at a middle place called Tatopani. We reached Ghasa, the entry point of Mustang district in 3-4 hours. There we boarded a minibus which safely dropped us Jomsom in another 3-4 hours. 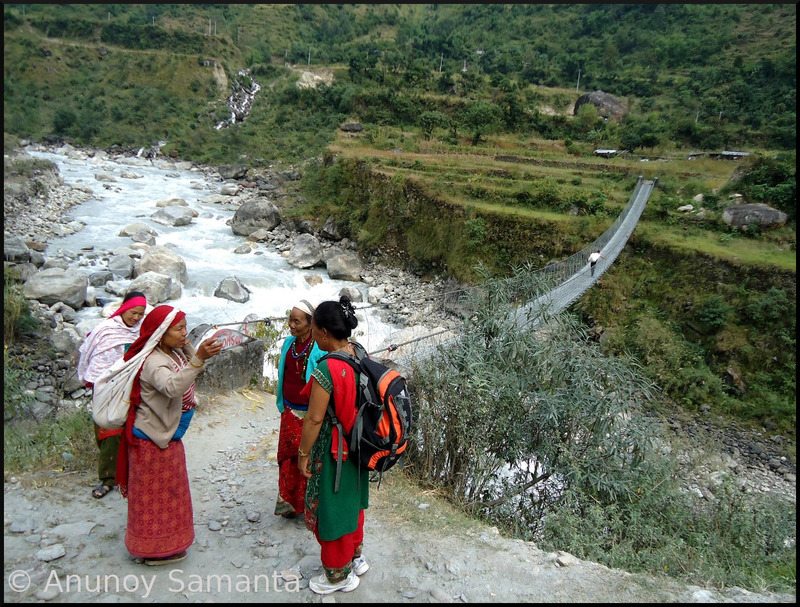 At first we were hesitant to take the minibus for such a risky route but there was no jeep available that time. Later we had fully cherished the bus journey though. Our destination Jomsom (district headquarter of Mustang) and Muktinath comes under Annapurna Conservation Area (ACA) which is the largest protected area of Nepal. One needs to get a valid entry permit for traveling/trekking in any region under ACA. Permits can be obtained either from NTNC office at Kathmandu or Pokhara. Be careful, double fee is levied if you’re caught without a permit in any of the field check-posts. Anyway, why to think of such situation?… it’s always sensible to be a good example for others and spread the word about eco tourism with dignity. So, we had procured our trekking permits beforehand which were checked and stamped at Ghasa. Slowly the temperature lowered which forced us to insulate more. 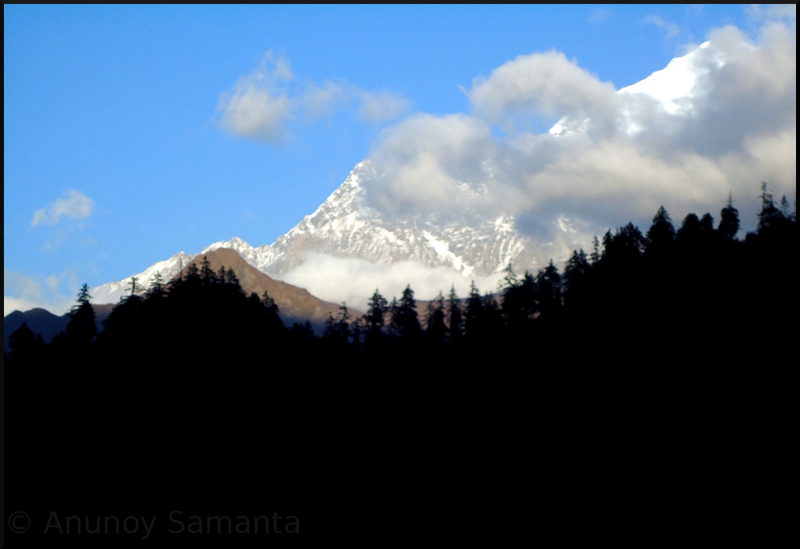 Very soon after we left Ghasa we got the magnificent snow clad Himalayan view which kept luring us throughout the journey till sunset. It was a first time experience of being so close to those white glossy peaks. Slowly the temperature lowered which forced us to insulate more. The angry river never left us alone. It was really difficult to photograph all those beautiful moments my eye had sipped due to the jerky drive. It was really difficult to photograph from our bus due to the jerky drive. 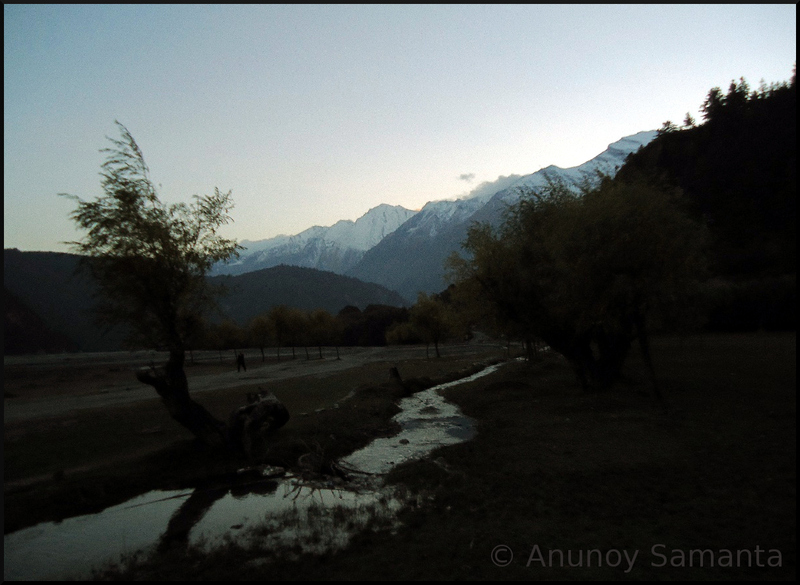 I got engrossed in the ongoing live documentary to silently watch our minibus crossing some shallow tributaries, apple gardens, charismatic setting sun, fading frozen summits and finally reaching the cute little town of Jomsom before 7:30 PM... 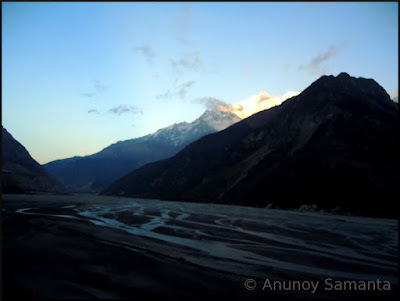 The sound of raving Kali Gandaki River mixed with whistling wind as we got down at Bus Park in the darkness of the air instilled a spirit of adventure in us. 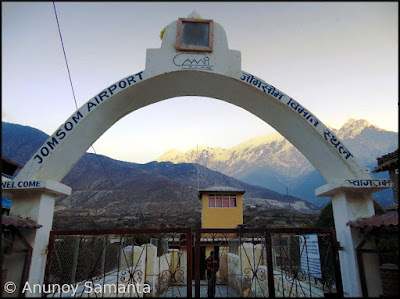 Jomsom Airport, located at an elevation of 2,682 m above mean sea level. We walked some hundred metres crossing a small bridge to get a descent accommodation which resembled more to a home-stay with a big board that read ‘Hotel Jomsom Paradise’. The coldness in the air and unavailability of warm water boxed out of our desire of taking bath and we succumbed to the warmth of the quilt just after sipping cups of tea, bread jam, chilly fried rice and dry chow-chow. Really supe clicks and well described trip in sll details. Cheers. Looking forward to go there some day. Were those Pigeons Courting or Fighting?